NASA astronauts Steve Swanson and Reid Wiseman and German spaceflyer Alexander Gerst show off their microgravity soccer moves in a NASA video released on June 25, 2014. Astronauts aboard the International Space Station have staged a zero-gravity preview of Thursday's (June 26) big World Cup match between the United States and Germany. 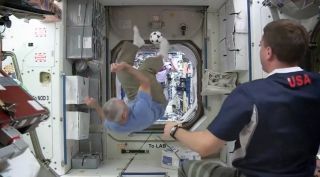 NASA's Steve Swanson and Reid Wiseman and European Space Agency astronaut Alexander Gerst, who hails from Germany, showed off their moves in a soccer exhibition aboard the orbiting lab recently. A NASA video released today (June 25) shows the trio performing acrobatic bicycle kicks, headers and — as players tend to do here on terra firma — celebrating riotously after scoring goals. NASA's humanoid robot Robonaut 2, which is designed to help astronauts perform chores aboard the space station, even gets into the spirit, waving its arms this way and that. The weightless action presages a pivotal World Cup game on Thursday in Brazil featuring the two teams currently atop the tournament's so-called "Group of Death." Swanson, Wiseman and Gerst are apparently pretty into the World Cup. The three spaceflyers also played microgravity soccer in another video that NASA posted on June 11, the day before the tournament — which is held once every four years — kicked off. "We want to wish all the teams and fans on the ground and in Brazil a great World Cup," Gerst said in that video. "Have fun and have peaceful games. May the best win." The three astronauts make up half of the space station's current Expedition 40. The other three crewmembers are Russian cosmonauts Alexander Skvortsov, Oleg Artemyev and Maxim Suraev. The $100 billion International Space Station is a collaboration involving five different space agencies and 15 countries. Construction on the immense structure began in 1998, and it has been continuously occupied by rotating crews since November 2000.